If your car is pulling to one side when you're trying to drive in a straight line, or it is vibrating at high speeds, it might be suffering from an alignment issue. A vehicle with proper alignment will have all four wheels pointing in the proper direction. 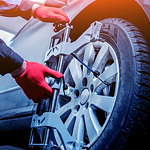 Hitting potholes, curbs, or other obstacles can knock wheels out of alignment and cause a variety of problems, such as uneven tire wear and poor gas mileage. Getting your alignment checked whenever you get an oil change can help you find small problems before they grow into something serious and expensive to fix. To get your car looked at in Amherst, bring it to Virginia Select Auto today. We'll make sure that everything is lined up properly, and we can perform any adjustments needed to get you back on the road.